The Calixtlahuaca-Tecaxic “Roman Head” was discovered by José Garcia-Payón in 1933 whilst excavating a burial site within the Matlatzinca city of Tecaxic (now named Calixtlahuaca). The Roman bust was found amongst a cache of offerings, including gold, turquoise, crystal and pottery, buried three floors beneath a sacred pyramidal structure. The burial site appeared undisturbed and dates between 1476 and 1510 AD. This means the piece must predate the Spanish conquest, which didn’t reach the shores of Mexico until 1519. So how did a “Roman” figurine head find its way into a pre-Columbian burial? However, nobody present during the excavation was alive to verify or deny the controversial claim, and no-one else connected with research of the site recalls any such claims being made. Payon’s son stated that Moedano hadn’t even been present at the excavation site. So, although Schmidt’s argument is the most logical, there is no evidence that there is any truth in it. If it was not a modern introduction as a hoax, then it had to be introduced at the time of the burial and before the arrival of Europeans on the mainland. This is possible, because although the Conquistadors did not reach the Mexican mainland until 1519, the nearby islands of the Caribbean had been colonised since the late 15th century, and Columbus’ parties had also reached mainland coastal regions from Honduras to Panama. So it is possible that the piece was brought from Europe and traded with the indigenous population and then the piece travelled via trade networks all the way to Calixtlahuaca. Whilst this would explain how a small Roman bust could have found its way to the burial site, it does also raise the inexplicable questions of why a Spanish colonialist or explorer would take a small 3rd century Roman head with them to trade and why an Aztec nobleman would choose it to accompany them to the afterlife. 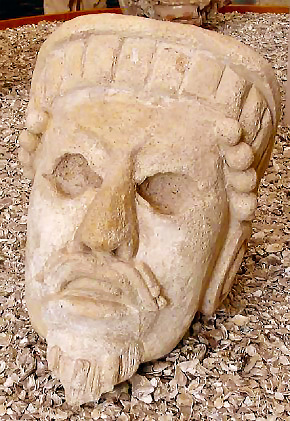 Monte Alban – Bearded ManThe answer to the latter question is that although it looks like a 3rd century Roman Emperor, and possibly is, there are plenty of pieces of Mesoamerican artwork that feature European or Persian looking bearded men and were highly revered. The ancient Olmec civilisation were particularly keen at creating foreign looking figurines – epitomised be their most famous pieces, the huge African looking Olmec heads. Other civilisations of middle Mesoamerica, such as the Zapotec, frequently used imagery of bearded foreign looking men. 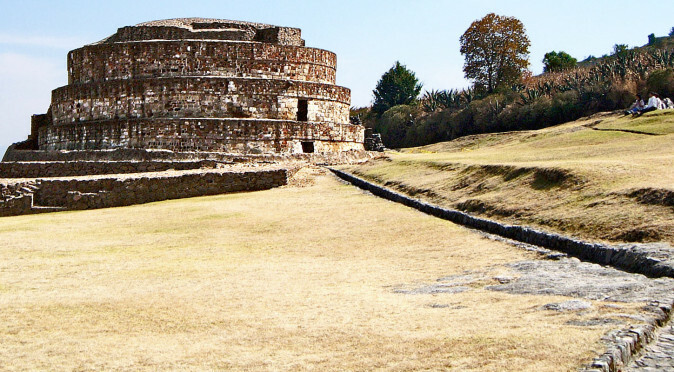 This region is also home to a city called Comalcalco, which appears to have been built using Roman techniques. 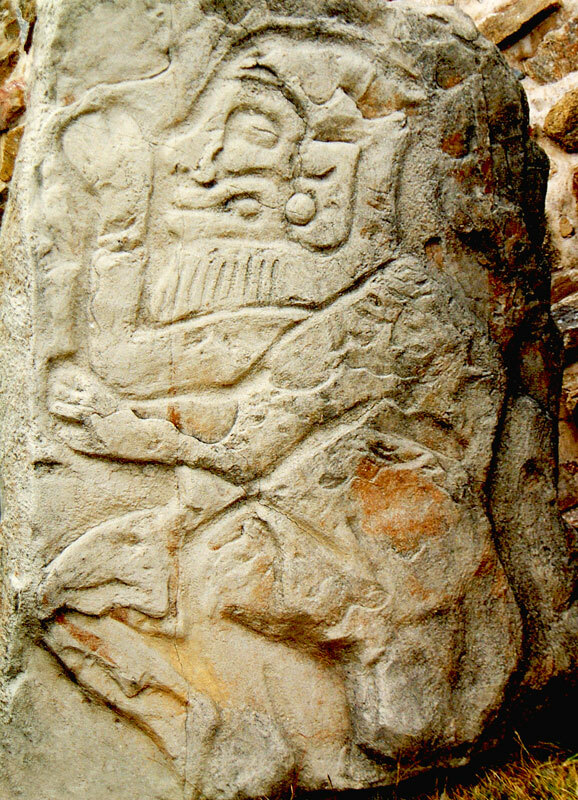 In the north, the Toltec claimed their civilisation was founded by a God named Quetzalcoatl who was a bearded white man – or least this is what the Aztec ruler, Moctezuma II, allegedly told Cortes and his party of Conquistadors when they arrived. So there is actually some evidence to suggest an Aztec nobleman would bury a Roman head with them. 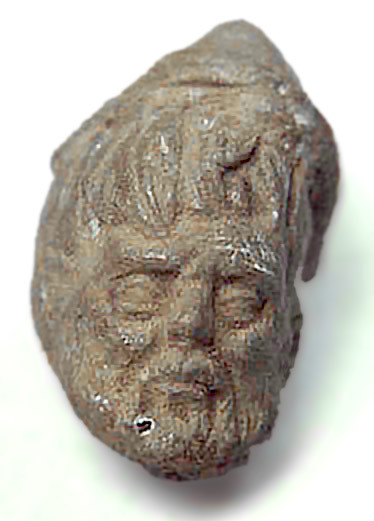 Comalcalco – Bearded Manexplore further west, but the lack of written accounts in Roman Europe suggests they never succeeded on the return journey. Of course, this doesn’t prove that Romans never landed in the Americas and the only way to answer this question is to find Roman artefacts and evidence of their influence in artwork and architecture within the Americas. Unfortunately, the Roman head of Calixtlahuaca is not conclusive evidence of Roman contact because the archaeology surrounding its discovery is not sufficiently robust – the documentation is massively deficient with a total lack of photography, the absence of drawn plans of the excavation and no drawings of the piece on discovery or the stratifigraphic context of the find. However, it cannot be discounted either and should be added to the ever increasing list of uncertain anomalies that suggest there was ancient contact between the Old World and the New. The Calixtlahuaca Roman Head is held at the National Museum of Anthropology in Mexico City, where it is archived as a Colonial piece. 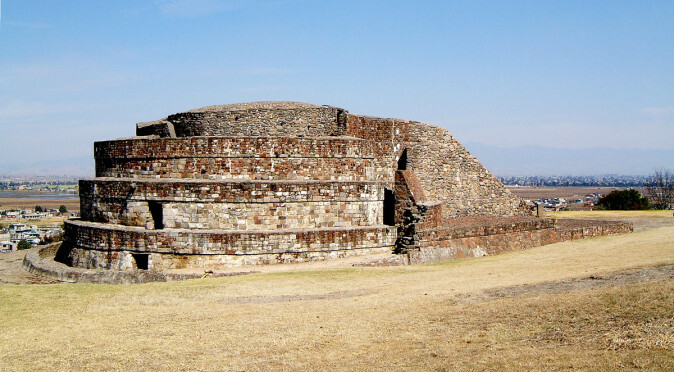 The city of Calixtlahuaca features a number of interesting references to the Serpent and the creator Gods - and it all starts with the serpentine shape of Building 3.